This is a post originally written by Joanna Mikulska, a young Polish Cultural Animator living in Hamar, Norway. We met Joanna during creamhamar, while she was enjoying the free lunch with her classmates from the Adult Learning Centre. She later told me about her work on history and participation and her idea of connecting her former work to dreamhamar. Here she is inviting you all to become part of dreamhamar. What are you waiting for? Warm yellow, light blue and white, very intense, very not Norwegian colors – I thought when saw installation in the middle of Stortorget- Even my fridge in Hamar has national, Norwegians colors. That same day, in the evening, I talked with the people who painted the surface of Stortorget Square and the stone cubes. It was them who told me this was a project by an urban collective from Madrid, boamistura. The shapes of the paintings were like a reinterpretation of the traditional Norwegian patterns for sweaters. The colors made an impact on me. Fresh air was coming to Hamar. I am a culture animator and event organizer from Poland. I came to Hamar about 3 months ago from Warsaw, where I was cooperating with History Meeting House and local, Warsaw House of Culture, Dorożkarnia Children and Youth Culture Center – every district in Warsaw has own culture center which is called House of Culture. 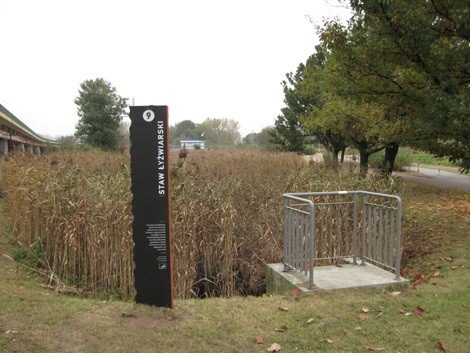 We often organized events in public spaces while cooperating with the local community. Of course Warsaw is a huge city, with strong traces of tragic history written in architecture and people lives, so problems and expectations are different in Hamar. Nevertheless, the way people think about public spaces could be similar in both cities. Perhaps Warsaw has something to share with Hamar about experiences in public spaces. 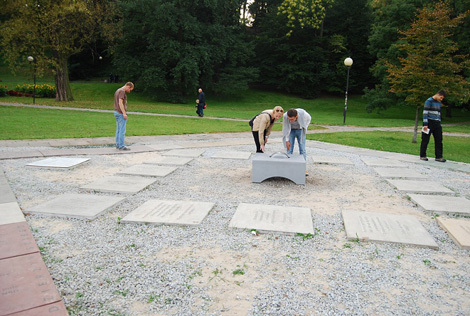 In Warsaw I worked on two permanent interventions in public spaces made by the institution I was working for. The first one is a game taking place in Warsaw Park (near the University). Lots of students walk around the park on their way to the library.”Segment – PRL for beginners” – PRL stands for People Republic of Poland, was the official a name of Poland in communism times, from 1952 to 1990 – is made according to rules known from board games, where you moved according to the roll of a dice. The game board has been turned into a fragment of grass in the park, playing fields have been made from stone tablets 1m x 1m, a dice was placed in the middle in a plastic ball that makes it easy throwing. Pawns in the game are the players who are moving from one stone field to another by rolling the dice and discovering the history of Warsaw during the communist time through the text written in stony squares. 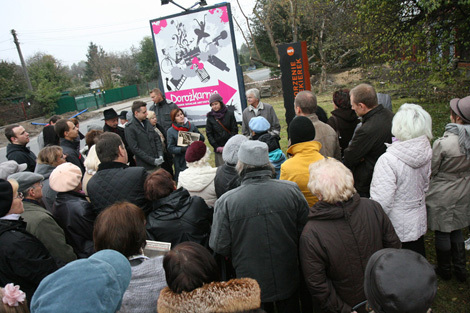 The second action in public place is a part of Roots of Siekierki, a big project. It is a network of concrete poles placed in a district of Warsaw in the places famous for history of that district, for instance: old school, tailor, minor house, forge etc. The history of this district was quite forgotten so we decided to rediscover it by interviewing its residents and gathering old photos. It took about 1 year to do it. Then we decided to use that knowledge in various artistic activities: photo exhibition, theater performance, paintings, book, documentary movie and cartoon, games for children, workshop with local history and in the end concrete palls in public space of district. Poles have been designed by group of architects 137kilo and the shape of them referred to the frame of old photos, of which one side is corrugated. We put 13 poles in different places, so they formed kind of network of monuments which describing the past of the district at the same time making the space more esthetic and nicer to stay there.